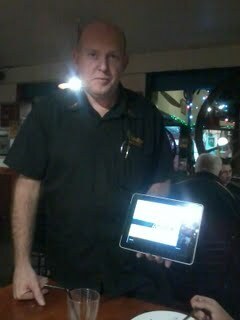 I was having dinner at Amigoes recently, when the waiter came over he took our order using an Ipad app. The app allowed the waiter to choose our options from the menu and place our orders on our ‘virtual table’. The app then sent our orders straight to the kitchen! When our orders were ready, the waiters were able to bring the food straight out to our table and knew exactly what each of us had ordered. The waiter said that the introduction of the new app was a recent development for the restaurant. At the conclusion of our meal, fixing up the bill was so easy! The waiter knew exactly what each of us had ordered including drinks! What a fantastic use of ICT’s in everyday life for beautiful efficiency, accuracy and professionalism. Check out the app at this site!